The portrait is the mainstay of photography; from the earliest stages photographers have strived to capture the human likeness on film. To begin with portrait photographs were seen as an alternative to oil paintings, presenting regal, distinguished views of the sitters. Latterly, portrait photographers such as Richard Avedon and David Bailey have attempted to truly capture the spirit of the sitter in their images. A portrait seems, on the surface, to be the simplest thing in the world, but when given some consideration it is easy to see that this is not the case. When attempting to create your own portraits (and, more accurately, when thinking about portrait composition), you should remember that there are three main types. The first of these is the ‘headshot’, which generally presents the head and shoulders of the subject. Secondly is the full body shot, in which either the entirety of the subject, or their head and torso are visible. Finally, there are some portraits in which the subject makes up only a small portion of the frame – perhaps less than a third.Headshots are the ‘classic’ portrait format. When taking headshots you have a few main factors to consider. The first of these is the angling of your subject. Very few portraits have the subject directly facing the camera; this is because a slightly angled pose allows for more flattering and, in some cases, dramatic lighting. If you are going to compose a portrait in this way, you should ensure that the eyes of the subject are still looking directly into the lens; the eyes are the most important part of any portrait photograph, and should be the main focal point. This can be achieved with good lighting, but also with tricks such as a very narrow depth of field which centres on the eyes. Full-length shots are often difficult to capture well. If you are shooting in a 35mm (or standard digital) format, you may find that the shape of the exposure works against you; avoiding a sense of the subject looming over the camera, while trying to ensure that the face is the focal point, is tricky in 35mm. It is perhaps no surprise, therefore, that many portrait photographers choose medium format. If you don’t have access to medium format, however, there are ways in which you can make full-length portraits successful. Again, ensuring that the face (and, particularly, the eyes) is the focal point of the image is generally vital, unless you are creating something more abstract. This can be achieved with lighting, but there are also less obvious ways of doing it. You could try, for example, finding some step ladders and standing above your subject. If you ask them to look up into the lens, and use a very narrow depth of field in order that their body is thrown out of focus, you can create striking and flattering portraits. Portraits in which the subject takes up only a small portion of the frame are difficult to give guidance on. In these cases, the image is as much about the surroundings as it is about the subject. However, you should bear in mind the Rule of Thirds when you are creating the image; if you place your subject (or subjects) on a point on the grid created by the Rule, it is far easier for the viewer’s eyes to move naturally around the frame. Furthermore, you should think about the background. This is a concern regardless of the type of portrait that you are taking, and has the capacity to ruin even the best-composed image. 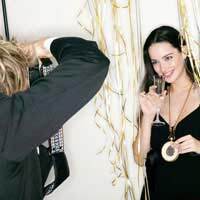 There is nothing worse in a portrait than a distracting background, and so you should ensure that you look carefully at your subject’s location when you are taking the image. If you have no choice, then the distractions can be mitigated by using a narrow depth of field to throw the background out of focus. Indeed, this is a popular convention for any portrait. Finally, you might also find it useful to employ some props in your images. Photographing people in their natural environment, or with the items that they use on a daily basis, can help the viewer to get a handle on the real nature of the subject. What Makes a Good Portrait?